Amy Boulden was last season's Ladies European Tour rookie of the year. 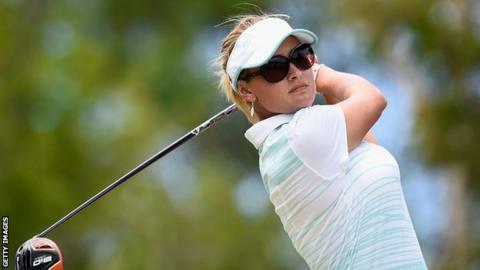 Welsh golfer Amy Boulden finished in a tie for fourth place at the Buick Championship in Shanghai. Boulden was second after 11 holes of her last round but then dropped three shots to finish on seven under par after a two-under round of 70. "It was a good week for me - my game is in good shape," said Boulden, 21. China's Shanshan Feng won by six shots on 17 under, Scotland's Pamela Pretswell tied for 11th on five under, with England's Liz Young one shot back. England's Florentyna Parker finished on three under, while compatriot Charley Hull, the 19-year-old European number one, had to settle for a tie for 18th after a final-round 75 left her on two under.